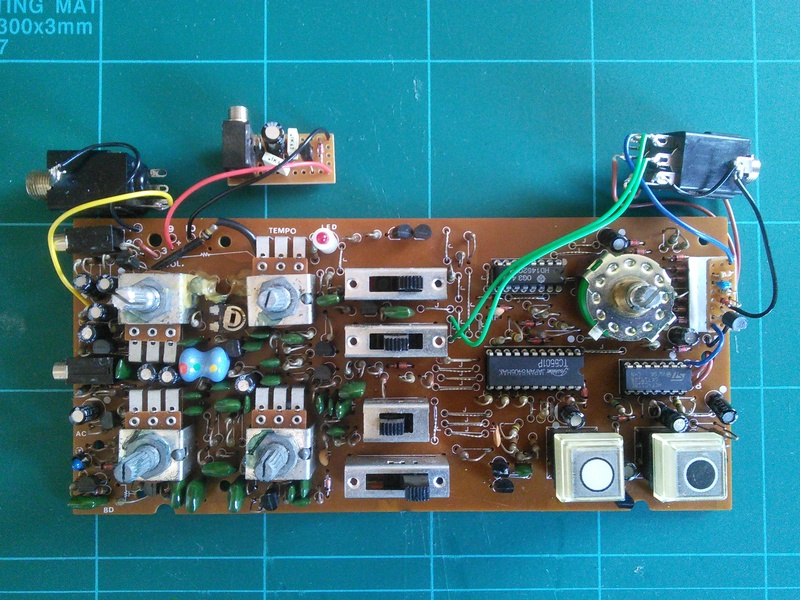 synthnerd A blog about synths – making them, using them, and fixing them. By default, the Boss DR-55 does not receive any kind of incoming clock. The ‘FS’ footswitch input takes a latching footswitch that starts and stops the existing clock, but that’s it. Although you can clock other equipment from the DR-55, it would be nice to be able to use an external clock to sync the Boss to, which would allow the Boss to trigger yet more devices with its CSQ and DBS outputs (active on Accented steps only and every step, respectively). My mod as detailed here does exactly that. By replacing the existing FS jack socket, adding a small circuit, and replacing a jumper, we can safely trigger the DR-55 from an external trigger. A quick internet search will turn up an existing clock input mod which is simpler to do and requires no extra parts; however, it puts the RAM at risk of damage from high triggers, and it does not sync the Boss’ own DBS output. It also requires ‘arming’ by hitting start before external triggering. My own mod, though more complex, overcomes all these issues: the trigger input is protected, both the Boss’ trigger outputs maintain their correct functions, and triggering occurs without ‘arming’. The only two functional disadvantages of my mod are that you must set the Boss’ tempo to Fast, and to reset the pattern when stopped mid-way you need to remove the trigger plug. I’m going to blog another small mod which will overcome the latter inconvenience [EDIT: No I’m not! I sold both my 55s, thereby halting this particular project]. Below is a diagram which shows everything you need to know about building this mod. Below that is a parts list. Key to this is the replacement FS jack socket; it needs to be TRS (ie. a stereo jack), with single pole changeover switches on the tip and ring contacts. I used a Lumberg KLBPSS3 (datasheet here, Farnell UK stock page here). The additional circuit can be made very small indeed (3 rows * 8 holes on stripboard), and there is plenty of room for it inside the DR-55, particularly towards the right-hand end. The photos below illustrate my own placement. There is one jumper to be removed, the one immediately to the right of the Variation switch. The replacement connections for the upper and lower point of this removed jumper are shown in the diagram, and you can see in the photos how I wired this up. In brief: remove that jumper, solder the two points to two jack pins; build the extra circuit, and solder that to the jack and to the main PCB; replicate two of the pre-existing connections from the jack to the PCB. That’s it. I also stuck a small folded piece of card to the PCB to stop the extra circuit from shorting against components. The new trigger input will accept any positive pulse over a couple of volts. It’s edge triggered, so the pulse can be any length over a couple of milliseconds. 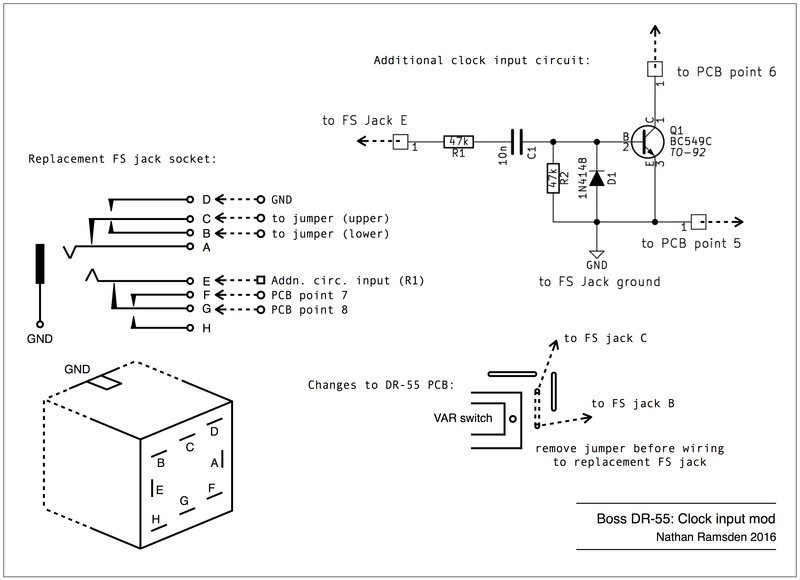 The operating principle is to use the DR-55’s existing clock, but to gate it on for a very short duration; normally when the clock is gated off again, the pattern resets, but the new jack socket enables us to disable that by breaking the reset connection when a jack is inserted. As I mentioned earlier, the Tempo must be set to Fast (ie. all the way clockwise) for correct function. This is because the DR-55’s clock, once triggered, finishes its pulse cycle. If this is longer than the incoming trigger cycle, it will ignore the new trigger; if we set the speed dial to its fastest, we can clock the DR-55 at any rate up to its natural maximum. The pattern will cycle round as usual, but if you stop mid-pattern, new triggers will continue where they left off. To reset the pattern at this stage, you need to unplug the trigger jack and hit Stop. This is not ideal, I know, and I will be making an amendment to correct this later [EDIT: project halted, see above. I have no current plans to do any further work on the DR-55]. My father in law is giving me one of these and I’m really interested in this and the 9v input mod… My schematic reading skills are pretty poor, but I’m going to give it a bash! Excellent! Feel free to ask any questions, and I’ll do my best to help. Superb info and tutorials, thank you. I will be doing the External Sync mod today. Are you familiar with the Bass Drum mod? If so I would like your advice. I did the Bass Drum mod recently and wanted to ask if it is normal or if you have the same situation where by any programmed Accent will cause clicking glitches on long Decays? For me it is so bad that I have to either program no Accent or keep the Decay time short so that it doesn’t clash with an Accent. 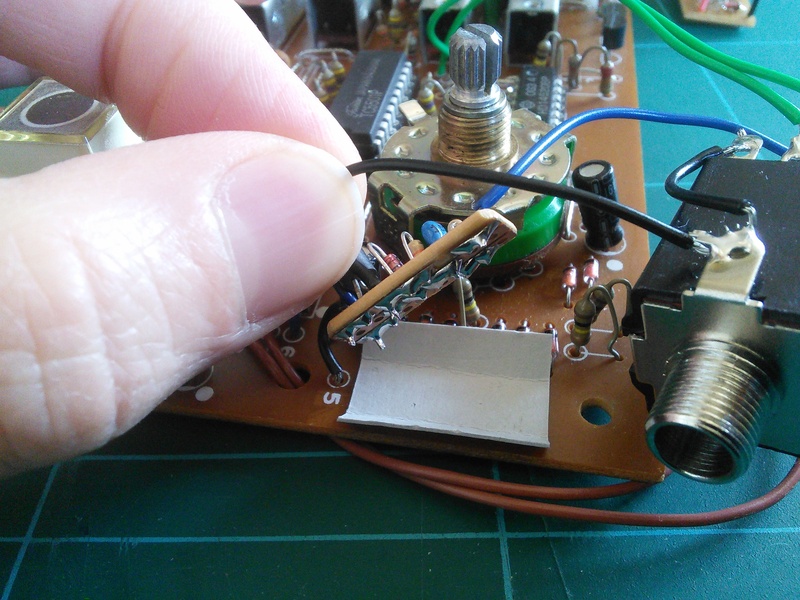 I no longer have a DR-55 to tinker with, but I did experiment with a Bass Drum mod – from memory, it was something to do with replacing a fixed resistor with a pot. I really didn’t find it useful, to be honest. It seemed to be unstable and the sound was not that impressive. 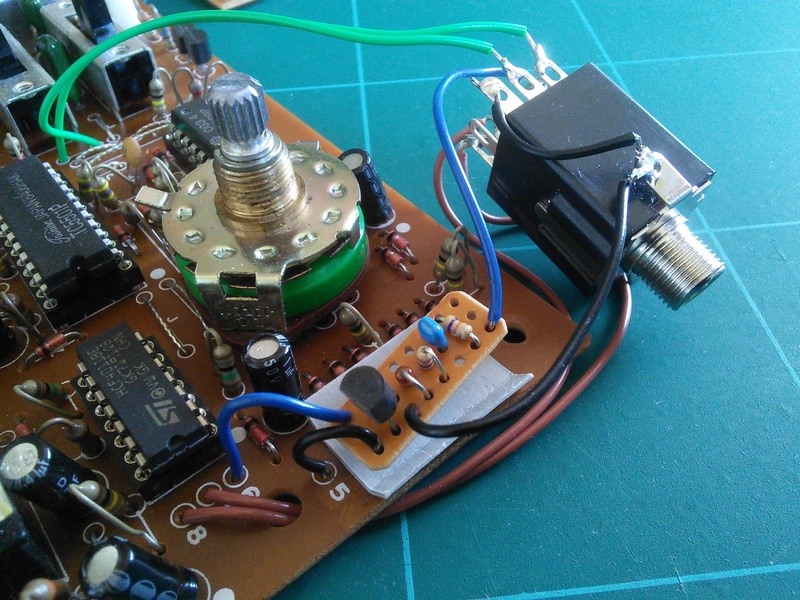 The principle behind the kick drum circuit is feedback – the circuit is just shy of oscillating, and when you ping it with an input trigger, it oscillates for a while and dies away. The resistor in question affects that feedback, so you can tweak it to set how long the decay takes. The down-side of this arrangement is that the circut will go into self-oscillation when you take that resistor beyond a certain point, and I seem to remember it messes with the gain as well – so basically I chose to leave it stock. There’s no way a DR-55 is going to sound like an 808, really. It’s got its charm, and I chose to leave the sounds as they came. I wonder if your clicking/glitching is because an accented sound is effectively clipping due to increased gain from the alteration of the feedback resistor? Thanks for your response. Now your Sync Mod 🙂 I don’t claim to be anymore than an enthusiastic musician with the ability to use a soldering iron. Amazingly I put together your circuit and the thing works. I am not sure if it is a fluke but everything works perfectly. It takes the tempo from an external trigger and is also putting out both triggers from the DR55. But could you just clarify something for me. I cut the tracks on the strip board in 2 places, is this correct or not? As I mentioned I am no expert in reading schematics and I have zoomed in as best I can on your jpegs to see the track side of your circuit. Thanks again for your advice. It depends on your stripboard layout, but yes, my little layout had 2 track breaks. Well spotted! Glad your build works, too. It’s good to know I’ve made things clear enough to follow. Thanks for confirming, I have been enjoying the new possibilities since the mod but will enjoy it more now I know it’s ok. Once more, thanks not only for a great mod and tutorial but also giving your time to help out, it’s really appreciated. where sr88 is slaved to a dr55.Do you know how to mod the sr88 to make it a slave unit? I’m afraid I don’t. A quick search online for the schematic shows it’s similar but not identical to the DR-55, but I’m guessing that the footswitch works in a similar way and the modification would also be very similar. Sorry I can’t help more at the moment. Funny thing, I came up with that hack DR-55 sync mod you linked to. Did it 20 years ago and posted it…the internet never forgets. Yeah, arming it was annoying, but I never did damage the IC. Dumb luck, but I’ll take it. 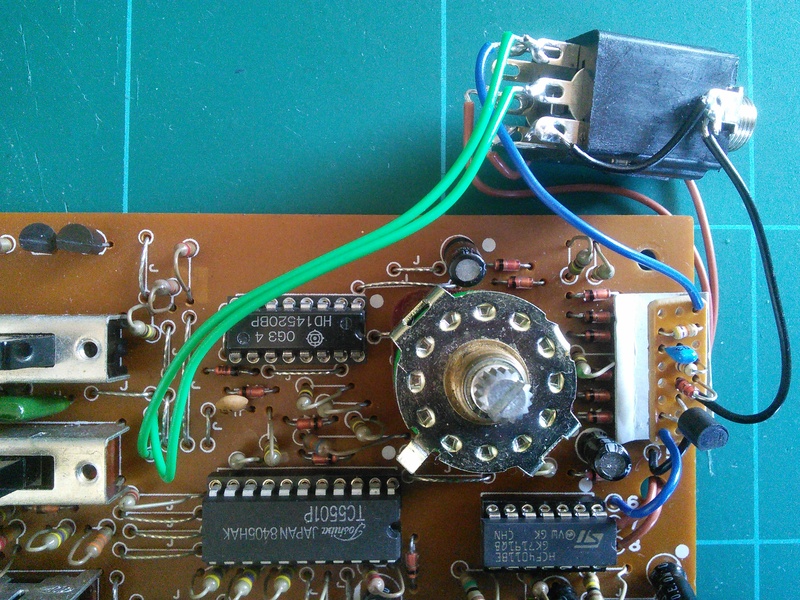 Going to do your gate input mod for the Werkstatt now…thank you for sharing the science. Dumb luck is how we get here. Hope you enjoy your Werkstatt mod! I am enjoying it! It works perfectly.